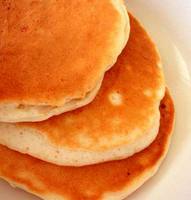 Sisters with Stuff: Pancakes for breakfast tomorrow? Try this tip. This is a great time saver for the morning and a money saver, when I make pancakes for breakfast I make extra and then I put then in a ziploc bag and keep them in the freezer so anytime my daughter wants pancakes I just pull a couple out and put them in the microwave. You could put foil in between to keep them from sticking to each other but I don't even do that, I just let them cool completely before I put them in the bag and they are fine. It saves money because I don't have to buy the frozen waffles at the store she's fine with frozen pancakes.